Susan was diagnosed with breast cancer in March of 2016. She hopes sharing the story of her journey will be helpful to others. 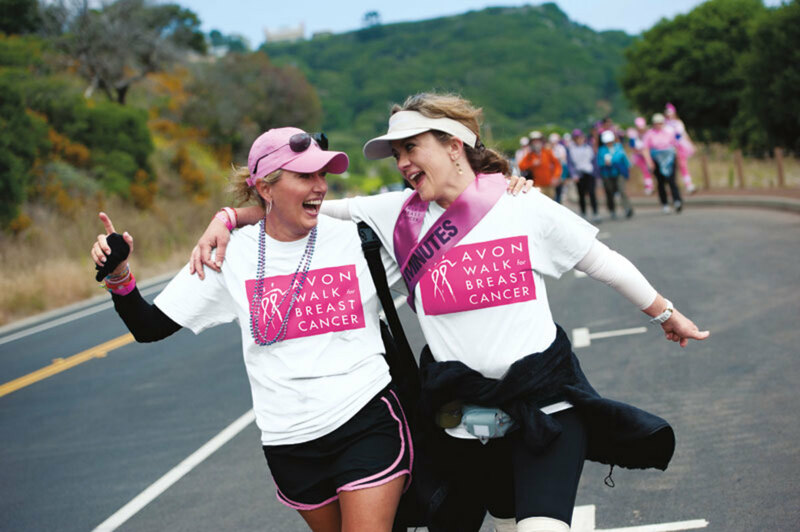 I am writing this series of articles because when I found out I had breast cancer, I asked other survivors about certain milestones in their own cancer journey. Most could not remember the specifics, and I completely relate to that. I decided to try to write down my experience, hoping there will be something in my journey that might be helpful to others who feel devastated when they hear they have cancer. I must add that no two people with cancer are alike, and I have found that no two doctors are alike in their treatment. These are important distinctions to remember when going through such a journey. We are each unique, yet sharing our experiences helps make us stronger and possibly gives hope and strength so we know we are not alone. In earlier posts, I said my breast cancer showed me blessings. The hardest part for me was finding out I had cancer then having to tell others. Life as I knew it was not going to be normal for a while. I didn’t realize how much I appreciated normal until I lost it. Isn’t that the way of it for all of us? At the same time, the love and well-wishes and prayers that came my way was, to say the least, overwhelming. Who knew so many people cared? If you are getting frustrated because I have not reached the part about the type of cancer, the procedures leading up to surgery, the decisions I made for the type of treatment, and the surgery, I apologize. It is, in fact, a journey, and I am sharing mine. If it helps one person to see how I handled a cancer diagnosis from the beginning, I have served a purpose. 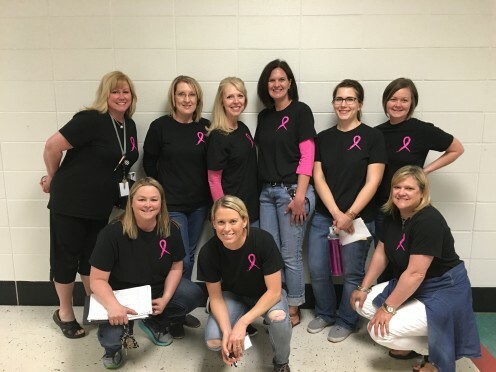 These teachers wore "Friends in the Fight" breast cancer t-shirts on my last day of school. I am an anxious person. On the outside, I appear calm, but on the inside I am having a panic attack. For over a year, I had been reading devotionals on my Holy Bible app dealing with anxiety. Each night for a year before this diagnosis, I prayed for peace, calm, patience, compassion, empathy, joy, strength, knowledge, and the Blood of Christ to cleanse anything from my life that steals those virtues and robbed me of the joy. It was working. God helped me deal with so many issues after I sought His help. Looking back, I see that He was helping me before I sought Him. Do you have a specific way of finding the positive during difficult life situations? The English Department threw the best going away party. God knew there was no place for negativity in my life as a cancer fighter. I didn’t know my studies of devotionals and Scripture were preparing me for something bigger than every day challenges, but He did. I believe He put it in my heart and mind to seek out help with my anxiety that could not be shut off in my mind by taking a pill. Medicine may help with the symptoms and I highly recommend getting a doctor’s help, but meds cannot change your environment. God gave me His Grace to help me deal with what life had to throw at me. I give credit to God for how I reacted and handled this situation. He gave me peace, strength, and perspective. It did not come from my inner self because if this had happened a couple of years ago, I would have been a mess and made everyone around me miserable. Nope, it is a God-Thing. Since I do not go to church on a regular basis, I was searching for a way to be in communion with other believers. I am a high school English teacher and discovered a ladies’ prayer group made up of teachers, secretaries, and custodians who met one day a week after school. Yes, I believe God placed this group in my path in order to help me. As with church, I did not consistently go, but I was part of the prayer group e-mail we shared, and I saw these women on a daily basis and prayed for their needs each time they shared. When I had my mammogram and received the news that I had an asymmetrical mass that would have to be biopsied, I e-mailed the group. I immediately received a request to meet after school for prayer. Of course, I said yes. Those ladies prayed for the will of God and for me to have peace and strength throughout this ordeal. I cannot tell you how awesome it feels to know you have a group of people fervently praying for you each day. Another God-Thing that happened to me from the beginning of this experience was that wonderful God-filled hymns and songs would pop into my head during the most trying times. Each hymn or song comforts me by letting me know that God has this. Some that come to mind: “Blessed Assurance,” “How Great Thou Art,” “This Is the Day,” “Our God is an Awesome God,” and “The Joy of the Lord is My Strength.” I love music, so these are only a few, but each song carried its own message from God. I also listen to contemporary Christian music and found comfort in each song. God was in control, and He showed me through little and big ways. God is my positive force, my positive energy. When I want to go negative, He gives me something positive to think about or to sing about or to laugh about. I highly recommend Him if you need a boost. 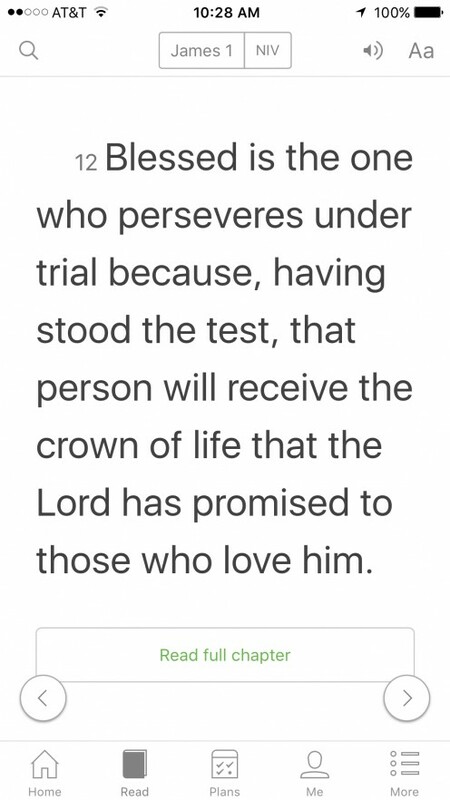 This verse popped up the day before my surgery. I realized I really didn’t know the extent of how people felt about me. Sure, we show people we care every day. We ask about each other, we “Like” each other’s Facebook posts, retweet each other's tweets, and we go on with life. This cancer deal completely overturned “going on with life.” I was tripped up and falling, but there were so many ready to catch me. My family rose to the occasion. My husband and kids went to every appointment and kept all the information straight. They researched and created a list of questions for each doctor. 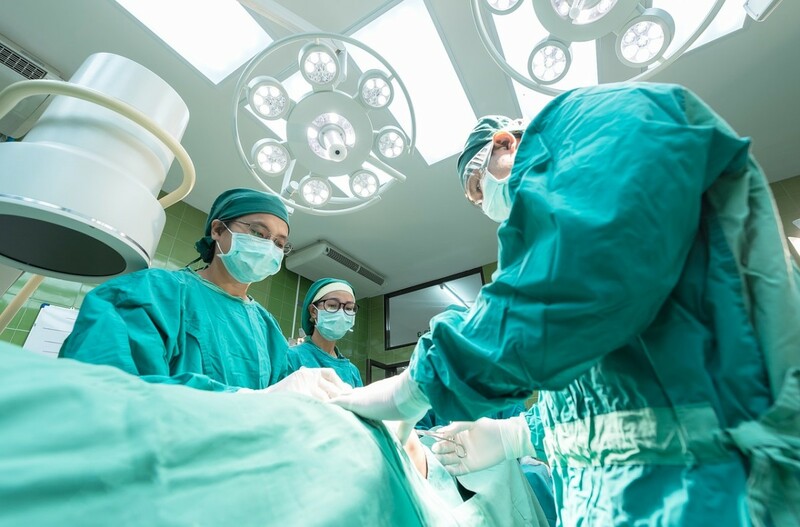 I was so consumed by what I had to do before surgery that I needed them to help me. I still have to ask them to repeat something the doctors said. At school, my administrators were so understanding about appointments and were concerned about my emotional well-being. 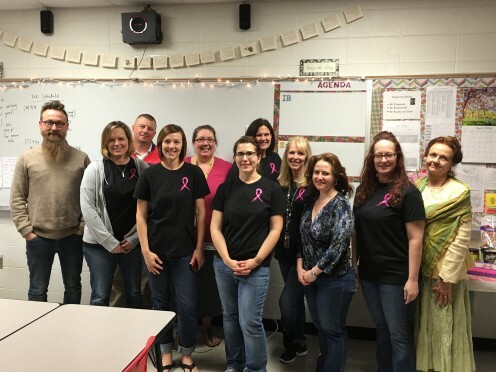 After I told my department and students that I had breast cancer, I was met with flowers, cards, and gifts on my desk each day of the week before I left. My heart melted knowing how much they cared for me. After surgery, my family screened calls for me while I was getting back on my feet. My sisters and friends came to see me and to just sit with me without talking. I didn't feel like I had to entertain anyone. Each Monday for five weeks, the English Department sent me a care basket. What a treat! I was really getting spoiled. I had cards from students and teachers. I had cards from people I hadn’t heard from in years. My Facebook personal messages blew up and I received several sweet posts on my wall. I just didn’t realize. I was touched to the very core, and even alone, I felt surrounded by love and positive thoughts and wonderful prayers. I do not know what I would have done without such a wonderful support group. I know there are many who do not have so many people supporting them during a crisis, so I no longer take for granted the blessing of all those in my life. The English Department collected all these wonderful well-wishes from around the school. A blessing I have not discussed in any of my previous posts is that my cancer was detected early for a reason. Two years ago, I had a fibromatosis (benign tumor) removed under my right breast. I have had to have a mammogram every six months since discovering that tumor. One year ago, I had a biopsy on what turned out to be a calcification. In September 2015, I had a mammogram and all was well; in December 2015, I had a checkup with my surgeon who removed the fibromatosis and all was well; in January, I had my yearly checkup and all was well. At all of these appointments, my breasts were examined and cleared. From January to March, a tumor grew large enough to barely be detected on my mammogram and sonogram. It was an aggressive cancer, and it was found in time. Again, a God-Thing. Go to your yearly appointments. Get your yearly mammograms. Do your own self-breast exams. Do not neglect these things. Even after medical science discovered my tumor, I still could not find it or feel it. I felt fine. If I had waited, I would not have known and the cancer would have grown and likely would have spread. 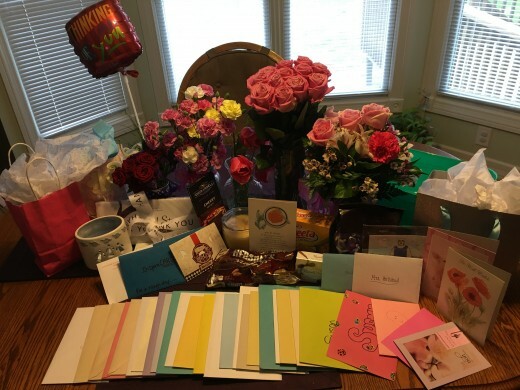 I received all of these wonderful well-wishes and gifts of love, but I felt like a fraud. 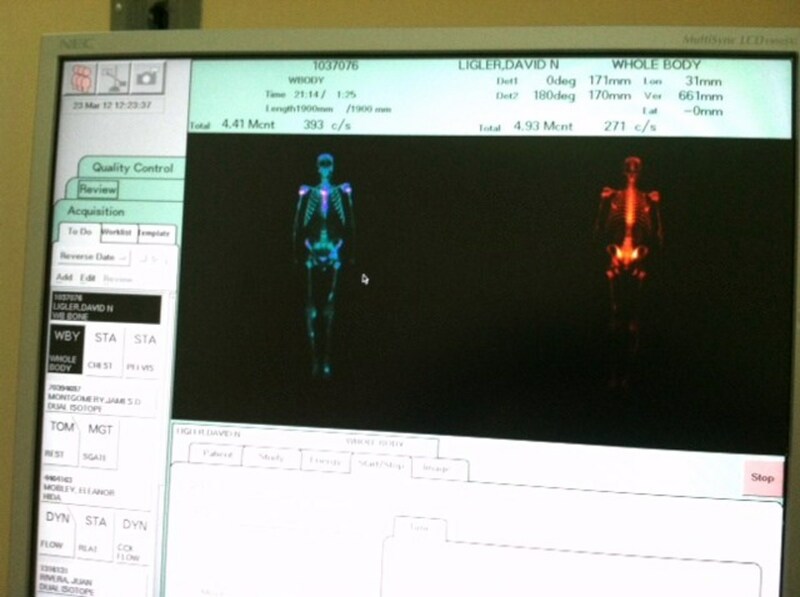 Before surgery, physically I felt great. I felt like I always did. I felt terribly guilty for all the attention I received. I felt like some type of deceit had been practiced. I didn’t deserve all of this. I was fine – but I wasn’t. Another friend of mine who had had breast cancer came to visit me after my surgery. I shared with her how guilty I felt and how I felt like a fraud in the beginning. She began to cry and told me she felt the same. My sister who had breast cancer 15 years ago said she remembered feeling the same. After talking to other breast cancer survivors, I think it may be normal. In all my time reading other women’s experience, I haven’t read anything about this feeling of being a fraud, but I think more women feel this way and just do not talk about it. The ugly truth for those of us going through cancer is that we are not deceitful, cancer is deceitful. It is sneaky, and it takes you unawares. If not caught early, it will kill you. Once you have it, there is a chance you can get it again. Even through the pain of surgery and the fear I lived with, I felt as if I had done something wrong. No! Cancer does not discriminate. Anyone can get it. That is the awful realization I finally concluded. Having cancer is an awful sinking feeling. I have been fortunate to be able to see the blessings while going through this journey. Those blessings have kept me positive and sane. I have always heard people talk about being positive. I acknowledge this as sound advice. If God had not prepared me through devotionals with Scripture, placed songs of praise and hope in my head, sent a multitude of angels in the guise of family and friends, and allowed a benign tumor that set me up to receive medical care every 6 months; I do not know if I could have been so positive because the cancer would have been left to grow for another year before discovery. I feel blessed and am thankful. God has been preparing me for over a year. I have experienced anxiety and stress, like many people, and I have prayed for peace, calm, strength, perseverance, love, and compassion for a year to deal with those negative feelings. God knew there was no place for negativity in my life as a cancer fighter. Please share your experience below in the comments. Did you find blessings in your cancer journey? Hi Teaches, God made it quite clear that He was helping me before cancer, but He showed me that there was a much larger purpose than just getting through the day when I got my diagnosis. What a relief it was to fall into His arms and know He was in control. Your story is one of hope and strength. Thank you for sharing from your positive experience. Although I have not had to deal with cancer, I have come to lean upon our God for his direction and strength through trials. So glad you realized God was preparing you and that he provided the love of many to pull you through. God bless you! Hi Martie! Please do not be sad for me. God has placed me on this journey for a reason. I am certainly closer to Him, and I hope something in my experience helps others. Thank you for your prayers! I am doing very well, and I believe in the power of prayer. Hi Peg! I am so glad your sister is doing well. I believe I am doing quite well, too. You are so right about the daily things we take for granted. I sure felt like I was getting perspective, and I still feel that way. Dear Susan, I am truly sad because you are on this dreaded journey - a journey I can but only hope will never become mine. Who else but God gives us the courage, strength, peace and hope we need when Life challenges us with all kinds of adversaries? Only when we find ourselves totally without strength, peace, courage and hope, we realize that He is the ultimate source of it. I'll keep you in my prayers. May this hub be a light in many dark tunnels. It's a fabulous idea to document your journey for the future when you are looking back at all the things you endured, knowing God's blessings carried you through this ordeal. I remember the exact moment I got the call from my sister, telling me she had stage IV breast cancer, and the difference it made in my daily life. The gratitude for the small things escalated along with the appreciation for nature like sunrises, birds chirping, water sparkling. She is still with us after all that she went through in 1999, thankfully. That reminds me, I need to call her. I know what you mean about spiritual songs that seem to come out of nowhere - "wonderful God-filled hymns and songs would pop into my head during the most trying times." Yes, indeed. Your journal will inspire others and help you as well.